When you think Georgia, you think far. 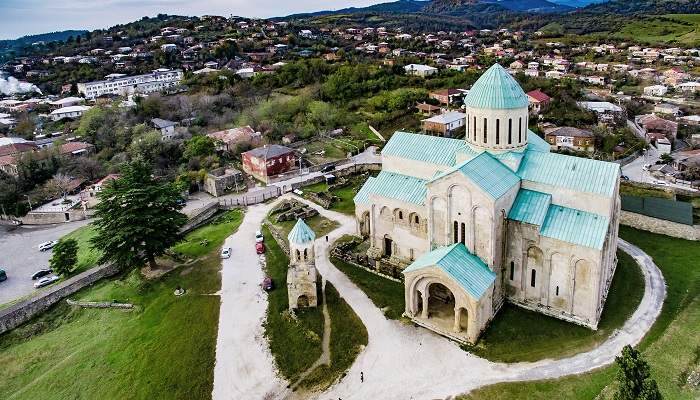 It is situated near the Black Sea, bordering Turkey as well as lesser-known Central Asian countries like Armenia and Azerbaijan. However, it is only 4.5 hours away from London and a great destination for a short break because it has everything – good weather, cheap food, great wine and nice, welcoming people. Kutaisi is the third-largest city in Georgia and the country’s legislative capital. Furthermore, it is one of the oldest cities in Europe, with a lot of history and some amazing sights in and around the city. Georgia has a subtropical climate which means it has dry, hot summers and wet winters. The best time to go is early summer or autumn, when temperatures in Kutaisi will be around 25°C. If you go during the second half of autumn, you can expect to get some real bargains as well as a cheap flight. 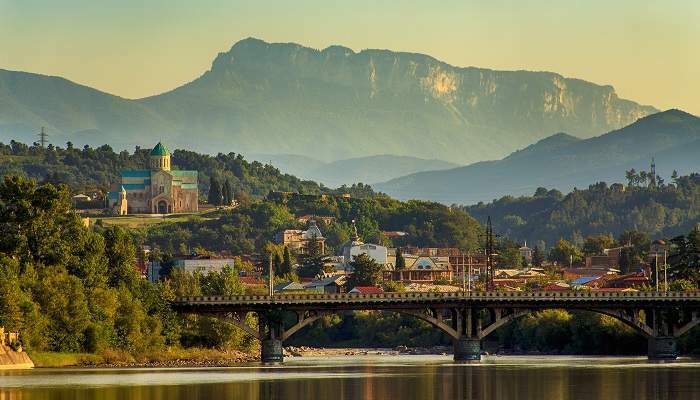 Wizz Air have just launched a new, direct route from London Luton to Kutaisi (flying out on Thursday night and coming back on Sunday), and you can get a return flight there for as little as £45! When you get to go that far it is truly a steal! Kutaisi airport is located around 25km from the city centre, so you can either get a shuttle bus to the city for 5 GEL (around £1.5) or grab a taxi for around 20 GEL (£6). 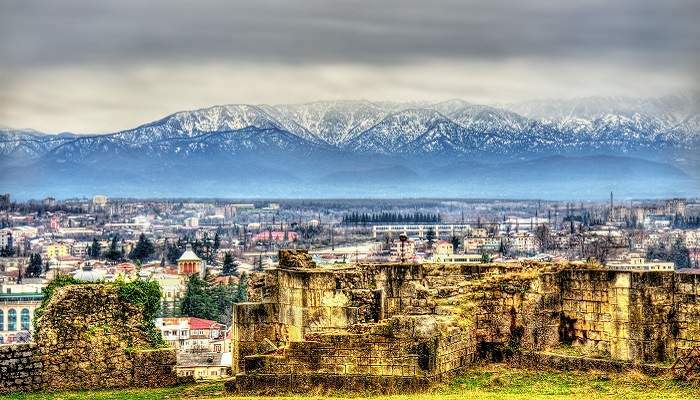 Kutaisi is a small city with a population of around 150,000 people, so don’t expect large chain hotels or resorts. Most hotels and hostels are run by families and often the owners will be living in the same building. 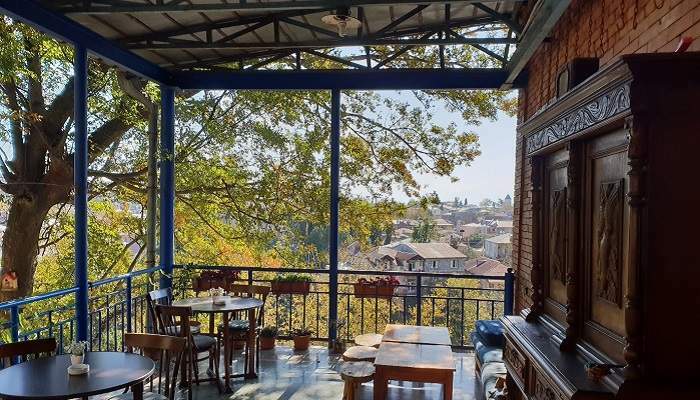 Sun Guest House on Bagrati street is a lovely place to stay, with its own wine cellar and beautiful views of the city. Their family room with city views, three beds and a shared bathroom only costs around £15 per night. The city centre is small enough and everything is walking distance. However, if you happen to be too tired to do that after a large Georgian feast of their amazing food and wine, there are plenty of taxis which you can either hail or book using a local app called Maxim. The Cathedral of King Bagrat in Kutaisi ranks among the best monuments of Georgian architecture. The construction began in the last quarter of the 11th centur. The cathedral was destroyed by the Ottoman troops in 1691 and rebuilt by the Georgian restorers, it is also part of the UNESCO World Heritage Site list. 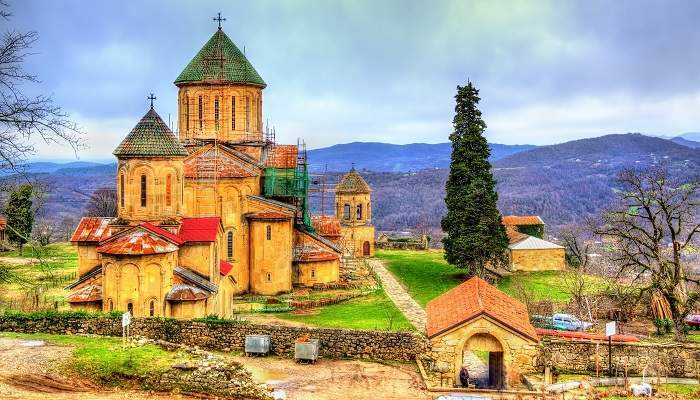 Its situated on a hill which provides great views of the Kutaisi Old Town. For even better views of Kutaisi, take an old cable car (2 GEL / £0.50) up to Besik Gabashvili Park. 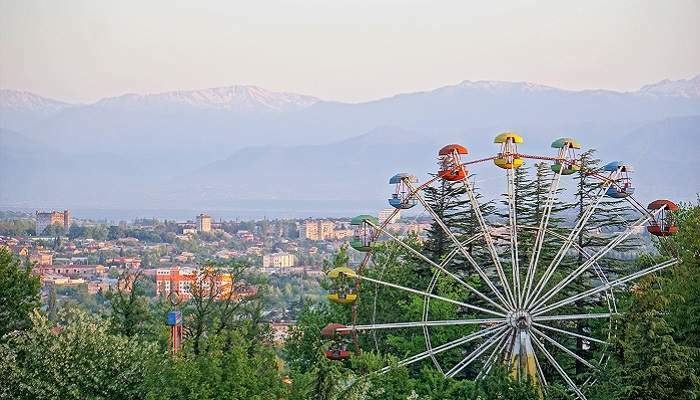 There you will be able to go on an old Soviet-era Ferris wheel and see the whole of Kutaisi and its surroundings. There are also other activities there as well as a traditional Georgian restaurant. Another UNESCO World Heritage Site is Gelati Monastery located just outside the city. It is a medieval complex founded in 1106 surrounded by countryside. It’s another prime example of beautiful old Georgian architecture and is definitely worth a visit. Ask any taxi driver to take you there for as little as 25 GEL (£8) return. 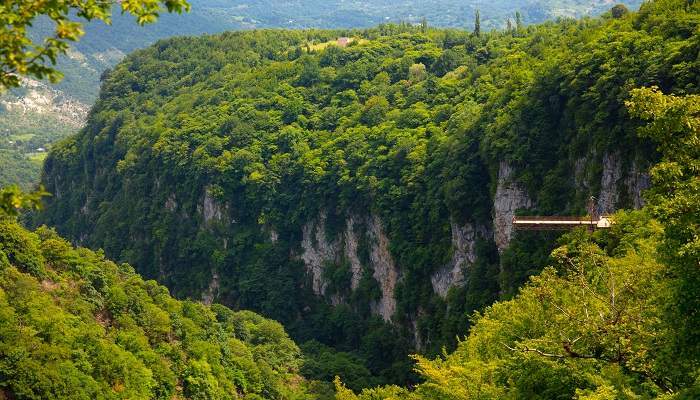 Located around 50km from Kutaisi Okatse Canyon and Kinchka Waterfall which will cost you around 40 GEL (£11.50) one way are sights not to be missed. Kinchka Waterfall is one of the highest in Georgia and is truly beautiful. You can go for a swim in the ice-cold mountain water if you dare, but otherwise the views here are comparable to those in the US’s Yosemite Park. Okatse Canyon can be reached on foot from the visitor centre by walking through a beautiful forest and includes various caves and smaller waterfalls, as well as a specially made path over the canyon that provides amazing views of the canyon itself and green Georgian mountains.